Since 2014, Dilma Roussef’s government has adopted a strategy of polarisation between “left” and “right”. Nevertheless, there is a huge gap between the administration’s “progressive” rhetoric and its neoliberal policies. Español. Português. Protests in Sao Paulo, Brazil, March 2015. Flickr. Some rights reserved. Towards the end of 2008, the up market Galería Oeste in São Paulo was selling plush teddies of Brazilian president Luiz Inácio Lula da Silva for US$20,000. The presidential effigy had become a fashionable lucky mascot. You could love it or hate it. You could mistreat it with feigned contempt but never lose respect for it. Artist Raul Mourão’s “Lula Teddy” project highlighted the president’s main achievement, namely to unify emotionally one of the world’s most unequal countries. Before Lula, the only unifying factor among Brazilians, at any rate according to the sardonic wisdom of bar chat, was the singer Chico Buarque. A few years after the PT (Worker's Party) landed in government, unanimity had become Lula: the homespun president who managed to please and compensate both rich and poor alike. Despite corruption cases such as the vote-buying Mensalão scandal, only 11% of Brazilians thought, back in 2008, that the president’s administration was bad. Lula was an icon, an almost untouchable myth. "He was a perfect product of mass marketing", Raul Mourão said at the time. Seven years later, the Lula Teddy has transmuted into a huge inflatable doll in prison garb paraded in demonstrations calling for Dilma Roussef ’s impeachment. On August 16, an enormous doll bearing the number 13-171 presided over a demonstration in Brasilia: 13 being the PT’s number in the electronic voting system and 171 the article of the penal code dealing with racketeering. The latter number is also slang for someone who is not to be trusted. From a lucky mascot to a satirical dummy. Lula, who a few months ago was in the running as a candidate in the 2018 presidential election, is not unaffected by the PT’s collapse in support. He too is in the spotlight for his suspected activities as an international lobbyist on behalf of the construction giant Odebrecht which is currently mired in a corruption scandal. According to a recent opinion poll, Lula would lose the election against any of three possible candidates of the conservative PSDB (Brazilian Social Democratic Party) - Aécio Neves, Geraldo Alckmin and José Serra. Dilma Roussef’s situation is unprecedented: her approval rating is barely 8%. How are we to explain the collapse of the PT which, in alliance with the PMDB (Brazilian Democratic Movement Party), won the elections in October 2014? The economic crisis and the Petrobras and Oderbrecht corruption cases (both involving the PT and the government) partly explain Dilma’s unpopularity. Large-scale events - the World Cup and the Olympics - whose legacy is doubtful and that favour the establishment at the expense of the public – partly account for the decline. But there is more, much more. Congress, chaired by evangelist Eduardo Cunha (PMDB), has become almost ungovernable. Cunha has gone from being a faithful ally of the PT to a declared enemy manoeuvring on behalf of conservative causes. Although he has just been denounced for corruption and may fall soon, Cunha has Congress in his pocket. Some member parties of the PT alliance have broken away. The Marxist Left (which founded the PT) has also separated. Traditional peoples’ movements are now criticising Dilma, although they continue to side with her in demonstrations. The disaffected groups who took to the streets in June are hardly involved in the protests either for or against that are currently taking place. Meanwhile, the conservative, neoliberal roller-coaster rumbles on in Congress. And Dilma is embracing the neoliberal Agenda Brasil, which is examining partial charging for public health care and the idea of redefining native reserves as “productive land”. An anti-terrorist law has been passed that can lead to protesters and “netizens” being imprisoned. Labour rights have been cut in the name of austerity. LGBT programs have been halted. How has the self-proclaimed "country of the future” come to this pass? How has a party like the PT handed the political agenda to the right? Some analysts are talking about the “venezuelization” of Brazil as a way of describing the current political polarisation. At first sight, the narrative of powerful media, conservative opposition and the PT itself reinforces the polarization thesis. On the one hand, people wrapped in Brazilian flags take to the streets shouting #VemPraRua and demanding Dilma Rousseff’s impeachment; on the other hand, unions, the social movements and leftwing citizens demonstrate against the impeachment, as they did on August 20. Nevertheless, the reality is infinitely more complex yet simpler. Polarisation is a skilfully crafted narrative construction. The great consensual dichotomy, the return to left-right antagonism, to the people-elite, is the PT’s last shot. It is a useful political fiction fed by both the right and the PT. Despite Dilma’s conservative drift, the right keeps on broadcasting the story that the PT is planning to stage “a Communist coup”. The PT identifies as “putschist” or “neoliberal” anyone opposing its government, and describes everyone taking to the streets against Dilma as "coxinha" (slang for "posh"), "undemocratic" or “fascist. As the two sides of the same coin clash, the system survives. And while the consensual dichotomy, ironically termed fla-flu (referring to a soccer match between Flamengo and Fluminense), is exacerbated, any hint of a third way dies before birth (much as Marina Silva’s odds at the last elections). The word that best defines the PT in its 2015 version is governismo (governism). Anthropologist Salvador Schavelzon defines governism as "a kind of cynical reasoning that fails to recognise nuances and acknowledge criticism or dissent and tends to associate any kind of dissent with the right and with neoliberalism. Governism diluted the outraged masses that took to the streets in 2013 for many different reasons, and constructed polarised masses with concrete guidelines and centralised organisations. Governism has replaced the ideology that built the PT from below and to the left. Governism fuels the consensual dichotomy that divides the people of Brazil and paralyses its politics. And here we come to the first great paradox: the PT is now voicing the same aggressive narrative that brought Lula electoral defeat up to 2002. Both Lula and Dilma won the presidency by softening their leftist image. The marketing wizard Duda Mendonça transformed a trade-unionist into a tie-wearing conciliator who smiled to the tune of Lulinha, paz e amor. Dilma won the elections in 2010 with the cosmeticized image of the Granma Who Is No Longer A Guerrilla, and appealing to God in her campaign. Marketing disguised the reality and altered it at the same time. And now, when Dilma y Lula have been transformed into the decaffeinated, capitalist-friendly image that marketing designed, the PT falls back on the leftist narrative of its prehistoric past. The problem is that, like the marketing that produced Lulinha, paz e amor, this progressive narrative which invokes the class struggle and the periphery, is partly false. The PT narrative, in Dilma’s neoliberal labyrinth, is quite plainly fake. Dilma’s politics are almost diametrically opposed to the left. Giuseppe Cocco, sociology professor at the Universidad Federal de Río de Janeiro (UFRJ), states bluntly that the PT is the worst kind of right, “neocolonial and corrupt”. The austerity measures imposed by Economy Minister Joaquim Levy are no different to the prescriptions of the Troika. Meanwhile, governism strives to find rightist elements in the pro-impeachment protests: pictures of demonstrators asking for a military coup or the death of Dilma. And in so doing it stigmatises as undemocratic coxinhas the hundreds of thousands who flocked to the streets against Dilma. At the same time, it embellishes its own narrative. One of the slogans chanted at the August 20 demonstration organised by popular movements against Dilma’s impeachment, was Não Vai Ter Golpe (There Will Not Be A Coup). Não Vai Ter Golpe, Não passarão (They Shall Not Pass), and América Latina antiimperialista (Anti-imperialist Latin America). At the same time, without any guilt complex, Dilma unfolds the red carpet in Brasilia for Angela Merkel and German capitalism. Reality is more complex and simpler at the same time. A study by researchers Pablo Ortellado, Esther Solano and Lucia Nader on the August 16 demonstration in São Paulo has had a powerful impact. 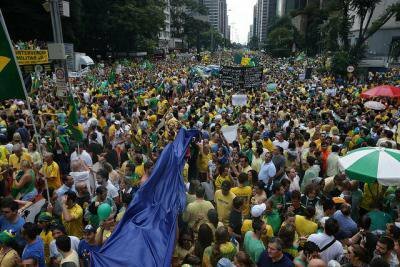 Based on street interviews, the study reveals that the demonstrations calling for the impeachment of Dilma, which were organised by conservative groups like the Movement Free Brazil (Movimento Brasil Livre - MPL), Revolted Online (Revoltados Online) and ComeToTheStreet (VemPraRua) was in fact more anti-systemic than anti-PT. The protests were not specifically right-wing. Politicians and conservative parties, such as the PSDB, were not spared. And here is the big surprise: a large majority of the demonstrators were in favour of public education (98%) and universal health care (97%), as opposed to the organisers. "They call for some policies that are to the left of Dilma," says Paul Ortellado. Despite a certain amount of schizophrenia and political confusion – demonstrators also wanted harsher punishment for crimes, it is fair to say that a part of the June 2013 unrest was the work of conservative groups, and was aimed at Dilma. Governism has placed street protest in the hands of the right. And the mass media are making hay with it. A large portion of the left, as anthropologist Rosana Pinheiro-Machado maintains, is still taken by the emotional blackmail that defines criticism of the PT is “a gift to the right”. And governism keeps on flaunting the spectre of a coup. “What are the odds of a coup occurring – asks social scientist Marcelo Castañeda – if the government enjoys the support of the PMDB, of media monopolist Rede Globo and the main private companies in the country? If there has been a coup, it was the PT’s, especially from June 2013, when it killed off the possibility of building leftwing alternatives by instigating repression instead of dialogue”. According to philosopher Marcos Nobre, the events of June 2013 signified a revolt against what he calls pemedebismo. It is precisely the alliance between the PT and the PMDB, concealed for public consumption by PT marketing, that define the limits of Lulism, of June 2013, and of any possibility of change. Lula governed by embracing a vale tudo (everything goes) attitude, signing territorial agreements with colonels, landed elites, multinational soya producers, and heirs of the dictatorship. And especially with the PMDB. It is no coincidence that Katia Abreu, a soya entrepreneur, is Dilma’s Agriculture Minister. Elsewhere, in 2008, Lula strengthened his alliance with Sérgio Cabral (then governor of Río de Janeiro State) and Eduardo Pães (mayor of Río de Janeiro), both of the PMDB, and both defenders of milicianos (paramilitaries). The pemedebismo block handed over the Río Olympics to Oderbrecht and other major corporations. And it reinforced governism as the sole modus operandi in Brasilia. This PT-PMDB alliance, in Giuseppe Cocco’s words, “destroys the struggle of the street sweepers in Río, generates slave labour in the Olympic construction sites, and cares more about the interests of multinational telecommunications and automotive companies than about workers’ rights”. Journalist Raúl Zibechi also denounces the Brazilian government's inability to understand the demands of June 2013, "the need to go beyond inclusion through consumption, to the obtainment of full rights." The PT, which is now Brazil’s most despised party, prefers to fabricate an antagonistic fable in which Eduardo Cunha, who a few months ago was pictured shaking hands with Dilma, appears as the conservative devil, and "the conservative wave", which mostly coincides with the policies of the PT, is to blame for all the problems. At the 2014 elections, when the consensual dichotomy between Dilma Rousseff and Aécio Neves was given its final touches, a meme began circulating of a sole candidate, Dilma Aécio, with a face melded from both candidates. Some activists ironically referred to the PTSDB as the great unity party. It is no coincidence that some members of the PT are now demanding a great non partisan agreement and that the president of Itau Bank should support Dilma. The first months of Dilma’s government prove that there would be hardly any difference between a PT and a PSDB government. There would just be a few symbolic variances, but no radically different narrative. Salvador Schavelzon, in El fin del relato progresista (The end of the progressive narrative), opens fire against the governments of the “Latin American left”, that espouse "the ideology of consumption, consensus development, exploitation of natural resources, and the political agenda of the religious sectors…”. If we add corruption to this withered narrative of progressive politics, a feature that the right has managed to turn into a legacy of the left, the symbolic downfall will be complete, thus opening the possibility of a new neocon cycle in the region. This is why the Brazilian left, which criticises the government while abandoning the streets and calling for demonstrations against impeachment, faces a dual challenge. On the one hand, it needs to organise a popular front, with and without the PT, which will appeal to grassroots movements but also to the indignados who support progressive policies while participating in demonstrations organised by the right, a front capable of building a viable alternative paradigm of government without governism. On the other hand, the left must generate a counter-narrative to Dilma’s (admittedly unlikely) fall, or to the PT’s (very likely) defeat at the 2018 elections. The opposition will explain that defeat by associating the left with corruption and the disaster of Lulism. It does not matter that Dilma has been practicing the most rampant variety of neoliberalism. Never mind that the PT has not dealt in the last 12 years with issues such as abortion or land reform. Opponents will sell the PT’s fall as proof of the impracticality of “utopias”, of progressive politics and of the idea of social equality. In 2015 there is no room for coveted presidential teddies. Nor is there room for the #TodosConChicoBuarque (#AllWithChicoBuarque) block. Many will cease listening to his music, on the grounds that he is a Communist. The only national consensus will be the artificial one of government without the people, so as to ensure that the system survives and that nothing changes. This is why the left and/or disaffected progressive citizens should confront Dilma’s political demise by constructing an alternative narrative: that of yet another Latin American president who fell or lost because she sold out to neoliberalism and to multinational corporations. Dilma would then be to Brazil what Fernando de la Rúa was to Argentina or Lucio Gutiérrez to Ecuador: a president who betrayed her principles. In this way, the downfall of the PT would at least serve as a means of safeguarding the ideals on which it was founded.